It’s the 2014 Super Bowl television commercials time and while the game goes on between the teams, mostly everyone cannot wait until the million dollars ad slot for the Super Bowl comes on. From the Budweiser’s Puppy Love, Full House Reunion for Dannon Oikos Yogurt to the Bud Light’s commercial of a random guy on hidden camera for the night bumping into celebrities. This showcases that video production with YouTube is a very strong marketing tool for internet and digital marketing platforms. Here are the videos listed below of the top five we enjoyed the most during the Super Bowl 48 game of 2014. Puppies are very cute. And puppies who have a giant horse for a best friend? Well, that’s just turning the cute factor on any dating service. 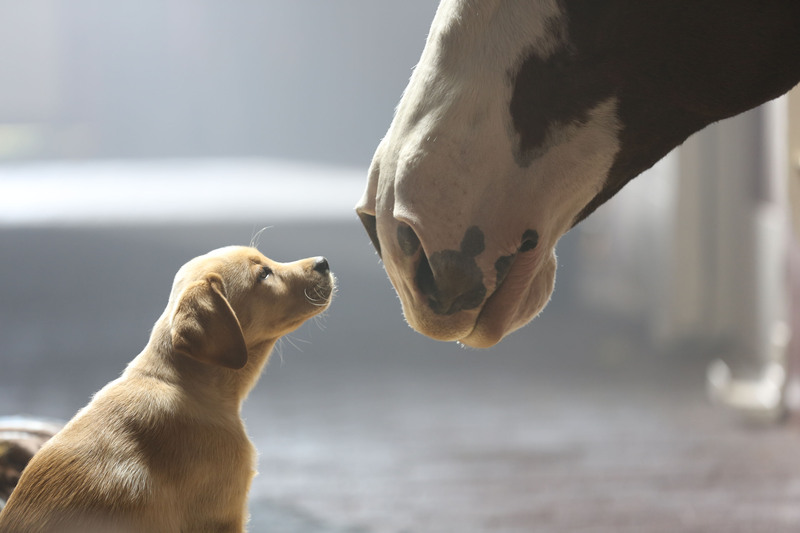 Budweiser’s “Puppy Love” commercial, generally there is no product placement, but they are going after the female audiences with this TV ad using their brand ambassador their trademark caring Clydesdales horses. Now, that aside it’s so damned cute it just went viral anyway, and the Bud logo does flash at the end, of course, so that’s their female target audience for Budweiser. The RadioShack ad was a great example of a company knowing what most people think about it (that it’s stuck in the 80’s era) and playing off of that notion to great comedic effect. In the ad, we see “the 80s” celebrities wreaking havoc on a dated Radio Shack. That means Dee Snider, Hulk Hogan, Alf, Chips, California Raisins, Kid and Play, Chucky from Child’s Play knocking merchandise from the shelves, etc. Oh so its Full House time with John Stamos! If you thought the man formerly known as Uncle Jesse was the naughty type, this ad for Dannon’s Oikos brand of Greek Yogurt will confirm that fact. In the Oikos Super Bowl commercial, a bit of spilled Greek Yogurt sets the stage for a bit of romance, especially when it involves John Stamos. In this case, though, before Stamos and his lovely lady friend can get down to business, the moment is ruined by other “Full House” alums Bob Saget and Dave Coulier to bust in on his lady skills. Apparently Stamos, Coulier, and Saget all live together now, and it seems that the latter two have become totally obsessed with cleanliness, unlike Stamos. And that’s about all we have to say about this middling Super Bowl commercial, unfortunately no more Full House episodes in the works. Beats apparently watches The Ellen Degeneres Show because they noticed she dances into the audience frequently. So someone at Beats thought why don’t we have Ellen dance in our tv ad to music using our Beats headphones, and surely the two were a match made in heaven. We are a fan of Ellen but this television commercial didn’t seem to fit well with branding or spreading the word of the mouth marketing. The Bud Light commercial you will see takes an average Joe (Ian), random encounter between a girl and a guy at a bar. The girl offers the guy a beer as long as he is open to “whatever happens next.” And what happens next is a whirlwind! Soon the man finds himself in a tricked out limo, next he is being dressed in a snappy suit by Minka Kelly, and then suddenly he is in an elevator with actor Don Cheadle and a six foot tall llama And then he steps into a room in which stands a ping pong table, and across that table is The Terminator himself, Arnold Schwarzenegger! Oh, and Arnold is dressed in 1970s style tennis garb and wearing a Conan the Barbarian-style wig! Finally the star of our commercial wins the game, at which point one wall of the room collapses, revealing thousands of fans watching their match and a stage set for a rock concert to begin that very second by One Republic.